Comfortable off-road: RECARO Cross Speed – "L" version. Off-road, the RECARO Cross Speed offers optimised seat comfort and a sporty side support, as well as easy entry and exit. The RECARO Cross Speed L is the ideal solution for medium-sized persons who attach great importance to good side support while driving. 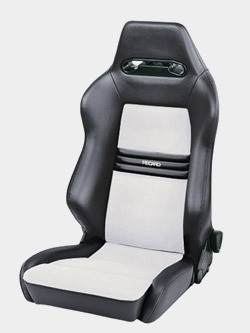 The seat surface, with pronounced side support, has a sporty design. Integrated headrest for reliable head protection. Belt guide for 4-point safety belt system; 3-point belt system can also be used. Specially formed shoulder support for optimum lateral hold. Backrest tilt-forward release on both sides for simple operation. Well-defined seat cushion and backrest bolsters for superb lateral hold when cornering. Lumbar support for ergonomic, fatigue-free seating. Recline adjustment on both sides for comfortable operation. Seat cushion extension: better thigh support relieves muscle tension. Length-adjustable seat cushion with intermediate side bolsters offering excellent lateral support.